At the time of writing, POLi has suspended online gambling transactions. Please read below to find out more and we will update this page if anything changes. POLi is a digital Australian payment method which has been used to make secure deposits at online casinos. While it was available at many of our recommended verified sites, as of September 2016 POLi has suspended it’s services for gambling transactions. We take a look at the great alternative to Paypal for Aussie players and the reasons behind the suspension. 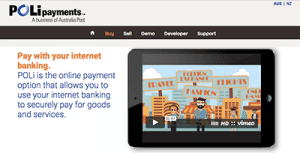 POLi was founded in 2006 in Melbourne as a branch of Centricom as an online digital payment service. When it first came into existence, it underwent many trials and errors, with the first version garnering criticism due to its lack of security protocols. The next edition increased security levels, but Apple users could not access the service due to compatibility issues. The latest version has address both security and compatibility issues and can now be used via your browser by Mac, PC, smartphone, and tablet users on a secure server. POLi is a service tailored for and primarily used by people in Australia and New Zealand. The largest single merchants using POLi Payments is Australia Post, Sportsbet, Sportingbet, Virgin Australia, Jetstar, and Air New Zealand. The service gained popularity due to its ease of making online gambling deposits, and its availability at secure online casinos for Aussie and NZ players. However, in 2016 the payment service gained negative attention for offshore gambling transactions after a report by the New Daily was conducted. This negative publicity caused the payment service to update it’s ‘prohibited merchant categories’ to include ‘offshore online gambling services’. 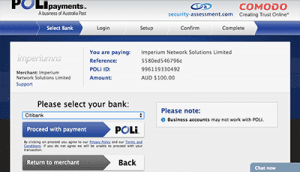 The investigation took heavily to Australia Post’s involvement, which could have something to do with why POLi have been quick to remove themselves from the secure online casinos, we detail above. While AusPost defended its position stating “POLi is acting in accordance with the Interactive Gambling Act and other applicable gaming laws,” the swift removal of the third-party processor from the gambling market proves there was pressure from somewhere. We will keep an eye on POLi’s position towards the iGaming market but for now you can opt for web wallets such as Neteller and Skrill, or credit or debit cards to make secure, safe deposits. If the service does become available again, you will need to know how to use it to make a secure deposit. If you’re the type of Internet casino player who prefers not to use credit or debit cards or direct bank transfers, POLi is a great ‘middle man’ service which can separate your bank account from your casino account and keep things organised – and most importantly, safe. Processing POLi deposits is streamlined and easy to understand. An in-built feature called “POLi Link functionality” is present in the online website which supports POLi as a payment option – essentially, POLi is listed as a deposit method upon reaching the cashier of the web casino. Then head over to your preferred casino’s banking section and choose POLi out of the list of deposit options presented. This will prompt the casino to ask for your bank from the list above and once you confirm, you will be re-directed to your Web banking account of your respective financial institution. As all major Australian banks have an online sector which allows you to perform Internet banking – n for example, Commonwealth Bank has Netbank – so you should be familiar with the process. Simply approve the transaction via your bank’s online banking interface and then the funds will be transferred from your bank account into your casino account, with POLi acting as the intermediary service. Ultimately, it’s a ‘middle-man’ and another layer of security for your deposits. Why is it a great PayPal alternative? Up until September 2016, POLi did everything PayPal could do and more. It acted as a deposit service primarily for Australian and New Zealand players, while also allowing secure deposits at safe online casinos, such as the many in the table above. Unfortunately, since the suspension it is now on par with PayPal in terms of online casino deposits, as both services do not allow gambling transactions. There are a number of other secure methods to opt for however. Unfortunately, many Web casinos don’t offer the option of withdrawals directly with POLi, which is a disadvantage to take into consideration compared to other services. This means you will have to find another service to make a withdrawal with – which is why many opt for web wallets, such as Skrill and Neteller.